The post-apocalyptic world of A Quiet Place presents its characters with a simple yet seemingly impossible challenge: never make a sound. Even the most minor of noises can attract the massive alien creatures, which attack their prey and destroy them in seconds. We begin 89 days into this nightmare, with the Abbott family scavenging an abandoned store for supplies. Not much remains with the exceptions of chip bags and other noisy items – a clever touch which went unaddressed yet added to the immersion of the world. This leads to a rather startling introduction that sets the tension in play – before flashing forward nearly a year, where the story properly begins. 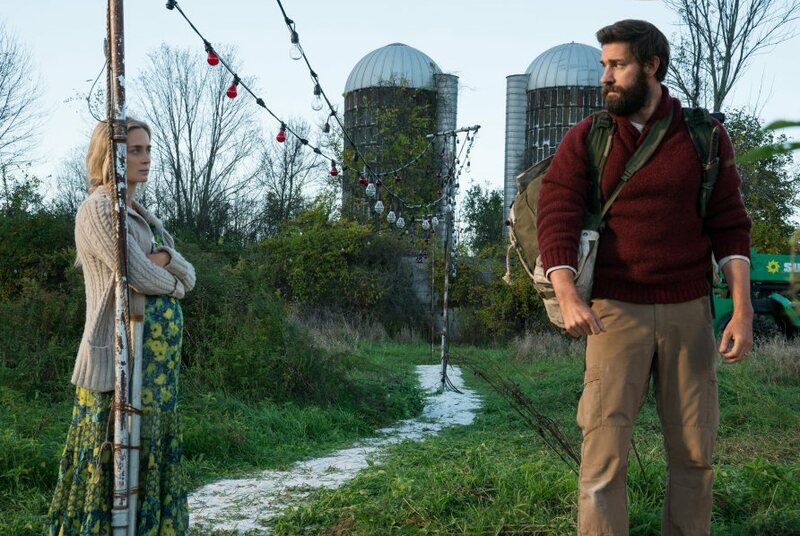 One of the better aspects of the story in A Quiet Place is that it doesn’t spend any time with clunky exposition or news broadcasts on how the story came to be; we simply begin with these characters and learn how things work as it goes along. Sadly, there are just too many instances in which A Quiet Place either fails to follow its own rules or just leaves a lot to be desired. A great instance of this is towards the very beginning of the film, in which the camera lingers on a utility pole, the cables ripped off and the foundation bent and damaged. Despite this, the family still has fully functioning electricity throughout the entire farm. It’s a strange decision to put visual emphasis on something that breaks the story in a rather obvious way when simply cutting that shot out would’ve made it more or less within the realm of acceptable suspension of disbelief. Director, writer and star John Krasinski made the wise choice to cast an actual deaf actress to play the role of the deaf daughter. In the beginning, shots focused on her are devoid of any sort of ambient noise that others pick up on, as well as a lingering shot on her earpiece which becomes crucial later in the film. Visual moments like these show that Krasinski definitely has a solid grasp on how to craft tension, it just feels like he had this unique concept and failed to flesh it out enough for it to be logically satisfying. On top of this, almost every instance of something appearing on screen is accompanied with an obnoxiously loud and unnecessary jumpscare sound effect. This choice only served to weaken the overall impact of the scarier sequences. Even with this decision, however, there still are a handful of incredibly effective scenes that build plenty of effective tension, sometimes accompanied by an equally suspenseful or gruesome payoff. For a solid chunk of the runtime, A Quiet Place really does deliver, even if it sputters out in the final act. The best way I can describe A Quiet Place is essentially a combination of 10 Cloverfield Lane and It Comes At Night, though not nearly as good as either of those films; primarily because the series of events became entirely predictable within the first act. What it borrows from It Comes At Night is the setting that takes place within the pre-destroyed world, and what it borrows from 10 Cloverfield Lane is pretty much everything else. In a lot of ways, A Quiet Place does feel like it belongs in the Cloverfield universe, both thematically and tonally. It’s just impossible to overlook the incessant flaws in logic that break the immersion and prevent A Quiet Place from being something truly great, which is a shame considering how much the film does well; the monster design is great, and their effectiveness is only amplified by largely remaining hidden. All of the acting, including the child performances, are entirely convincing and emotional. The film is also very well shot, utilizing clever visual cues and simple things such as running water and light bulbs to turn a seemingly simplistic setting into one that seems lived in and consistently interesting to look at. Krasinski definitely shows an understanding of building effective tension through clever visual filmmaking but is unable to create a story that feels logically consistent or emotionally resonant. A Quiet Place plays out like a series of excellent ideas and several well executed suspenseful sequences blended into a script that doesn’t quite hit the mark. The way these scenes flow together feels organic enough, and its strengths are undeniably admirable, but a clunky ending and an overreliance on poor logic and jumpscares prevent it from living up to its grander potential. Even with these flaws, however, audiences seeking a good thrill should be mostly satisfied by its bursts of effective brilliance, nerve-shredding tension, and excellent performances – just so long as they’re willing to overlook the film’s logical inconsistencies and underwhelming final act. Honestly, your summation pretty much is spot-on in describing this movie. Well done.